austraLasia - 4809(I)_"Behold, I make all things new"
4809(I)_"Behold, I make all things new"
Phnom Penh, Cambodia, 4 August 2018 -- Sour Bernadette Pheng Sreymom, a Cambodian native, made her First Religious Profession this Saturday at the chapel of Don Bosco Teukla before Mgr. Enrique Figaredo, Jesuit and head of the Battambang Apostolic Prefecture and Mgr. Anthony Sami, MER and head of the Kompung Cham Apostolic Prefecture. 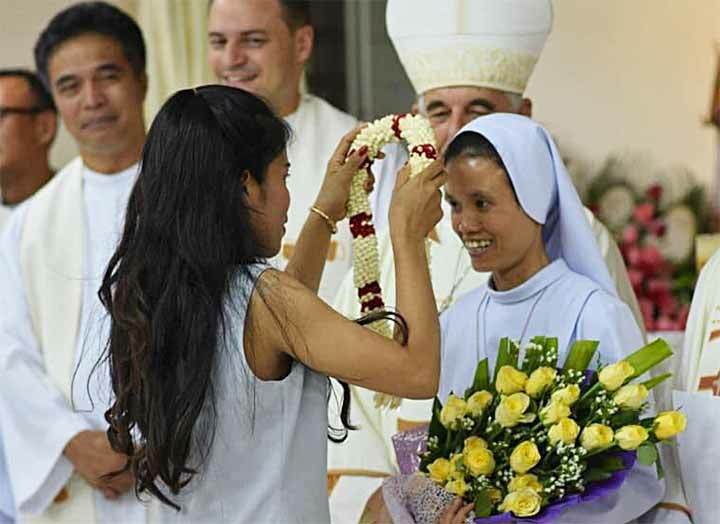 She is the 4th Cambodian young woman to joint the Salesian Family as a FMA. Members of the Cambodian Salesian Family, other religious groups, lay people, past pupils of the SDB ad FMA and friends, assisted to the ceremony of this important event for the Salesian Family history within the Kingdom of Cambodia. 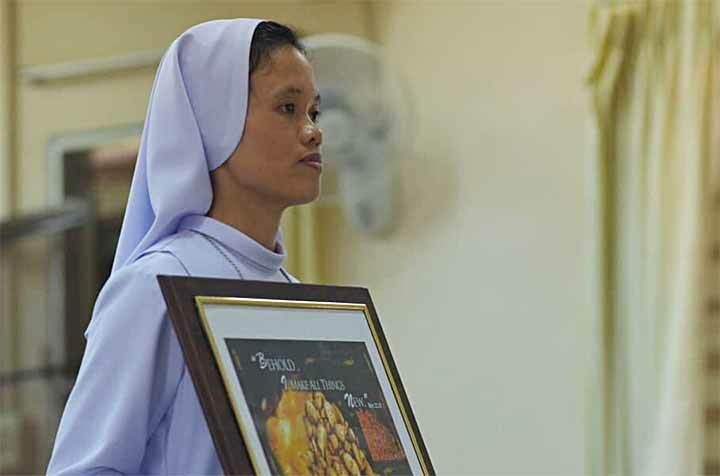 The FMA made a province with Cambodia and Myanmar, where sister Jessica T. Salvaña from the Philippines is the actual Provincial. The headquarters are in Phnom Penh. The FMA arrived to Cambodia in 1992 and have 2 houses in Phnom Penh and 1 in Battambang. Mgr. Enrique Figaredo, Jesuit, is the leader of the Apostolic Prefecture of Battambang, where the FMA has a house, working closely to the Cambodian Catholic Church. 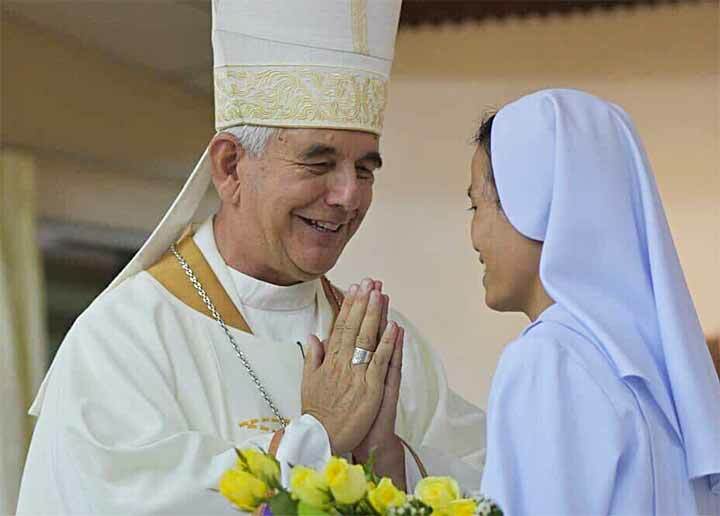 Sister Sreymom greets the Bishop during the ceremony of her First Religious Profession. "Behold, I make all things new", is the motto of the First Religious Profession of Cambodian Sister Sreymom. FMA Past Pupils made a traditional Cambodian offering to the new religious Cambodian young person ready to bring the charisma of Don Bosco and Mother Mazzarelo in this Southeast Asian kingdom. 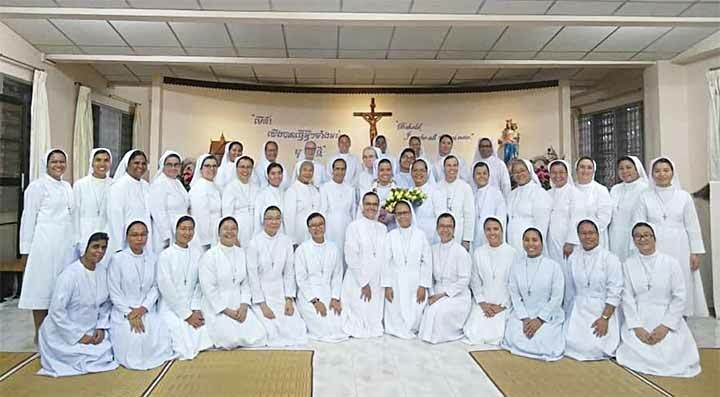 The Cambodian FMA Sisters, more than 25 years working with the Cambodian Catholic Church to the benefit of the poor, especially poor girls and young women, living today a feast of religious consecration. 4809(II)_How many are the Salesian Brothers in our EAO region? 4808(III)_What kind of Bosconians for the youth of PNG?